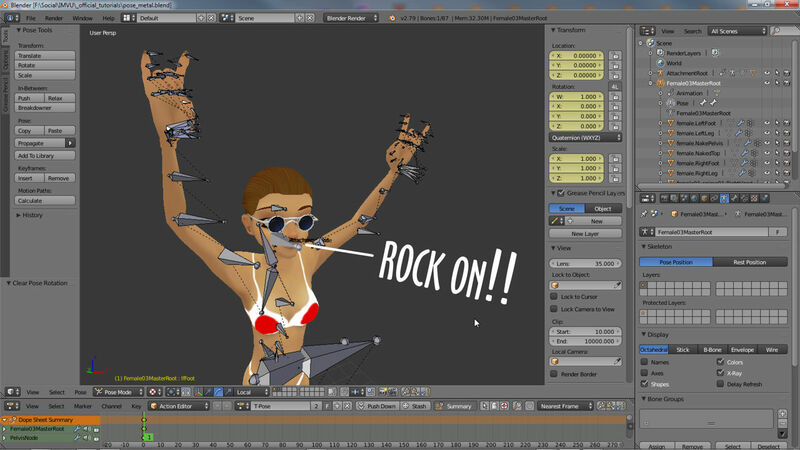 Download the avatar pose file for Blender here. The file used to make IMVU avatar related poses in Blender is called the Avatar Pose file. It can be used to make statue or static poses – poses in which the avatar appears frozen or stuck, unmoving. And animated poses – poses which have the avatar appear to perform an action, move, gesture or articulate in some way. Both static poses and animated actions are created the same way. 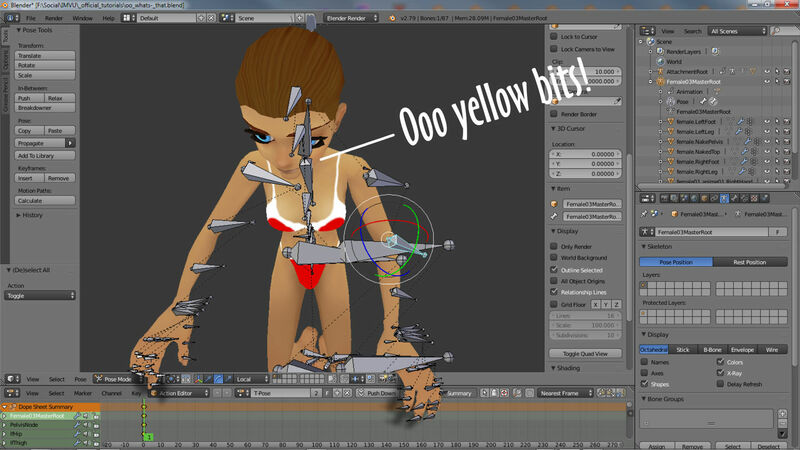 When loading the IMVU Pose file into Blender the screen may look similar to the above with the pose-able avatar occupying most of the main 3D View. Below is the Action Editor where the sequence associated with the pose is edited and manipulated. Avatars in IMVU are essentially comprised from a set of meshes, visible to the User, and an underlying skeletal structure, invisible to the User. This skeleton controls the meshes and how they move and behave. Without this, avatars won’t do anything beyond standing in the same spot with their arms out-stretched. I’m drying out OK!. If the Blender Pose file isn’t changed, upon import into IMVU the avatar will likely stand with its arms outstretched (commonly known as the “T” pose). The way this all works is as follows; each mesh is uniquely identified and positioned relative to a particular section or element of the avatar, e.g. a separate mesh for ‘foot’, ‘hand’, ‘hips’ and so on. 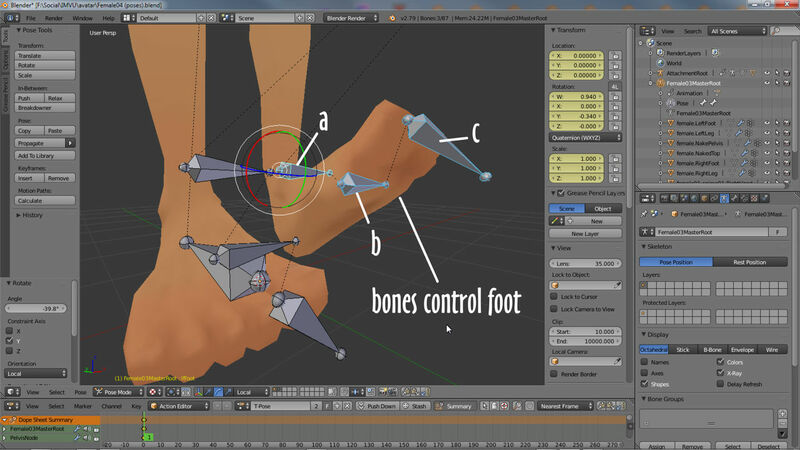 Being specific means they can be controlled by different bones within the skeleton corresponding to each mesh – ‘foot’ bones control ‘foot’ meshes and so on (a left/right pairing for either foot in this instance). As each mesh is controlled by different bone, together the entire avatar can be manipulated and posed simply by moving and articulating the skeleton. And this is essentially how avatar poses and animated actions are created; the skeleton controls the avatars meshes through the manipulation of individual bones to create a specific pose which is marked to the timeline as a sequence. For more help with Vertex Groups see here. Oww me bits!!. 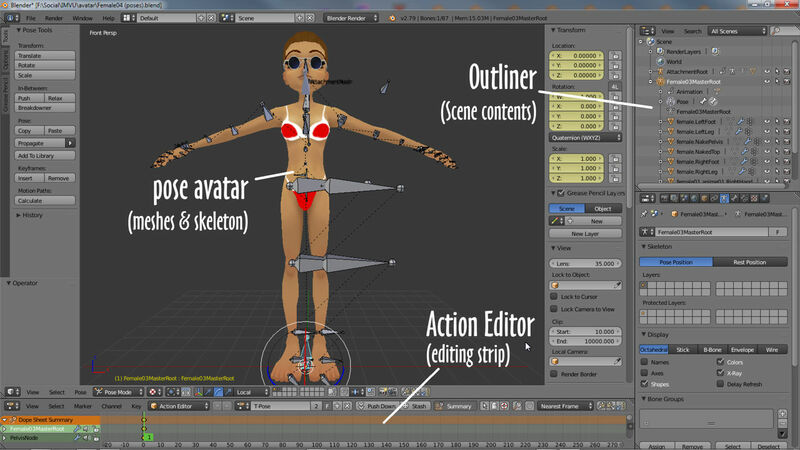 The Pose avatar includes a set of default meshes so the articulation of the skeleton can be seen and more easily visualized. Ooo so that what me bones look like!. Each part of the avatar, the individual mesh sections, is controlled by an underlying skeletal structures that’s invisible to the end user. 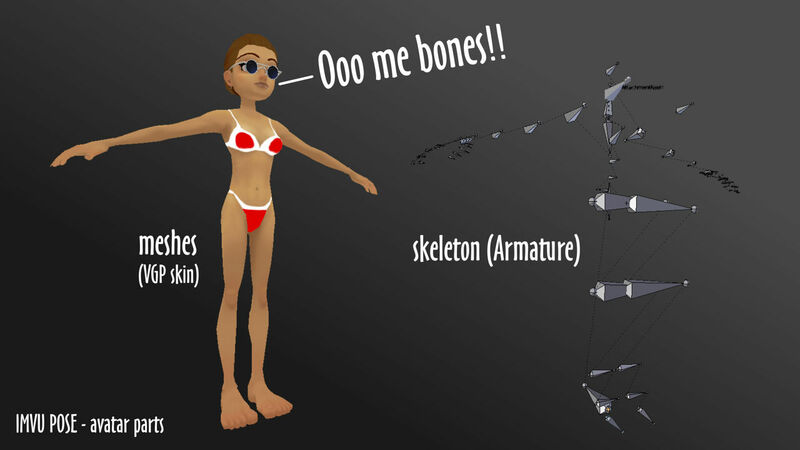 In Blender the skeleton, or Armature as its called, is visible to help make the pose creation process easier. Although most poses and animations are made by manipulating the avatar in the main 3D View (the big window where the avatar stands), the animation or static pose belongs to an overall sequence. This is where the Action Editor comes into play, it being used to collate, edit and manage different poses as might be part of a longer avatar action – once a sequence has been created the frames it contains are exported and used by IMVU to replicate the action .